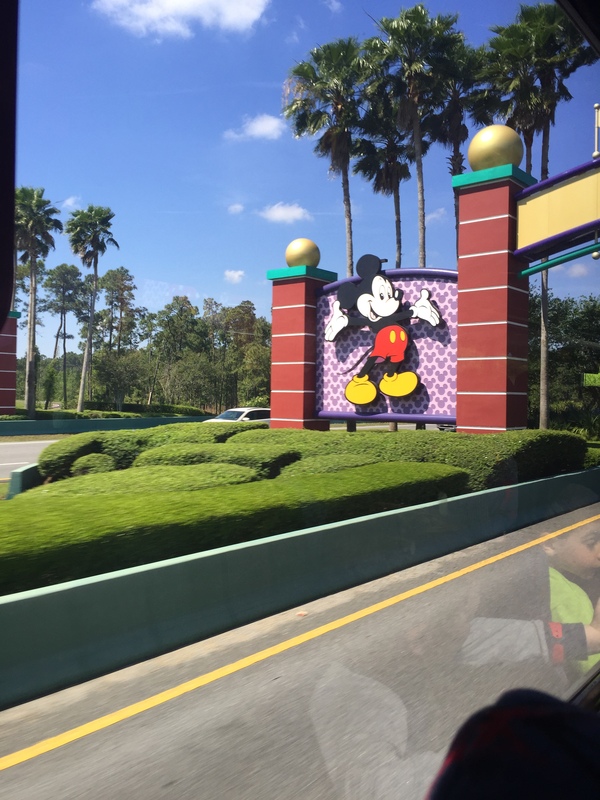 My family vacation to Walt Disney World has come and gone, and have suffered from the post-Disney blues as I tried to get acclimated back to my normal life. Our trip was truly amazing and once back home I had quite a task of trying to organize over 2000 pictures and 6 hours of video between all my family members. Not to mention I also had some new pressed coins to catalog and display. 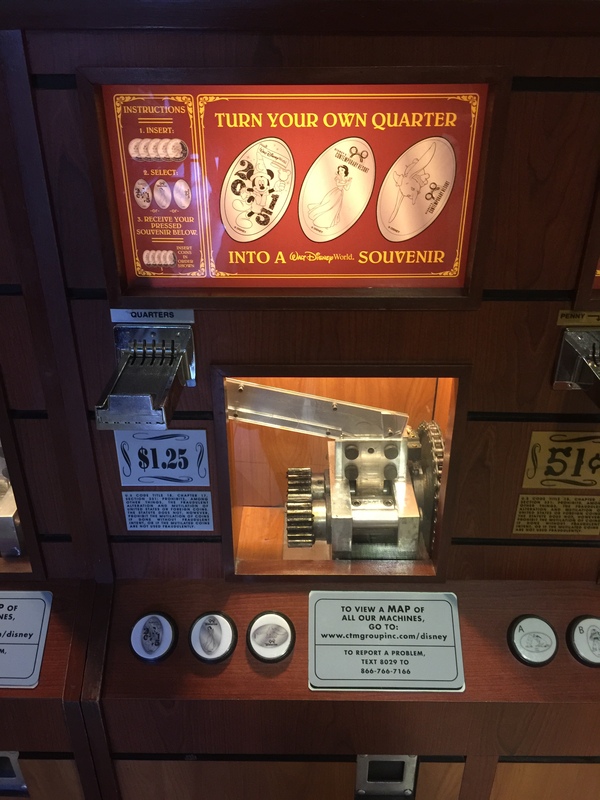 Over the next few posts I’m going to detail out each day of our trip and will primarily focus on the pressed coin machines I visited but will also insert some anecdotes about things we encountered along the way. Just as a heads up Dole Whip is my new obsession, if you haven’t tried it you MUST. But I’ll get into that . Day 1 started with a 5 am wake up time (to be honest I didn’t sleep much the night before so I was already kind of up). 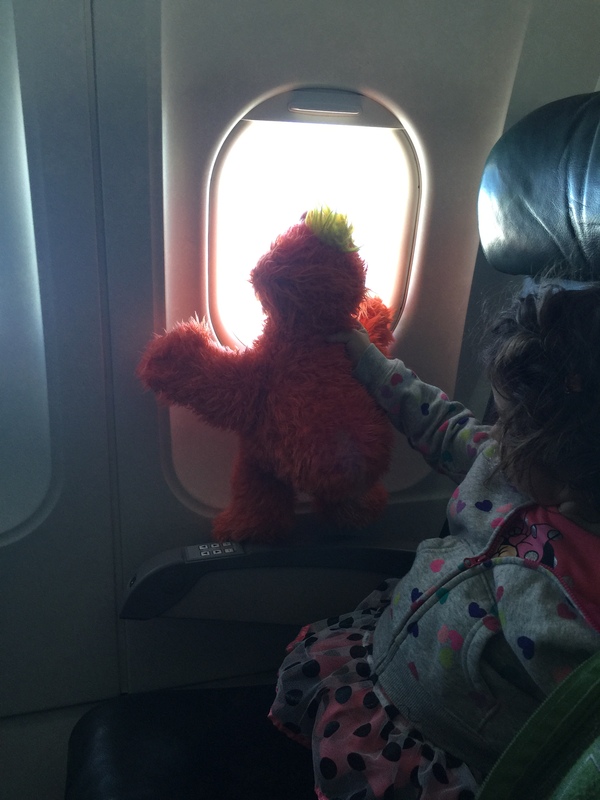 With our bags packed we carpooled with my parents over to the airport where we met up with my sister and her family. Our flight left around 7:30 am and about 2 hours later we touched down in Orlando. The glorious Florida heat was a welcome sensation from the cold weather we have had in the Northeast. Disney makes it really easy to with airport system in Orlando. We had special tags for our luggage so we didn’t have to pick them up and instead they were automatically transported to our resort later that day. Following the signs in the airport we made our way to the Magical Express which are nice air-conditioned buses that transport you from the airport to your resort. It took about 30 minutes or so but we finally saw the magical road sign we had been waiting for. There were a few stops ahead of ours but eventually we arrived at the Contemporary Resort. Of course the always entertaining and never gets old part of this resort is the monorail that runs directly through it. After the Magical express dropped us off we were immediately greeted by a cast member. Unfortunately since we had arrived early our room wasn’t ready yet. We decided to head in anyways and get an early lunch at the Contempo Cafe. This is a quick service type eatery, the system is pretty cool. You first walk up to a kiosk with a touch screen system and select your order, then a receipt is printed out. You can then pick up desserts from the display case, drinks and other snacks then when ready you head to the checkout lanes to pay. With the new MagicBands we all had on these are also a great new technology. Not only were these bands our park tickets, but they also opened our resort room, had our Fast passes and most dangerous of all you can pay for things with them. My dad was anxious to try his out so he used it to pay for our lunch and it worked like a charm. The lunch was must better than I had anticipated as a quick service location. We tried burgers, salads and a flatbread pizza kind of thing that were all ready tasty and filling. 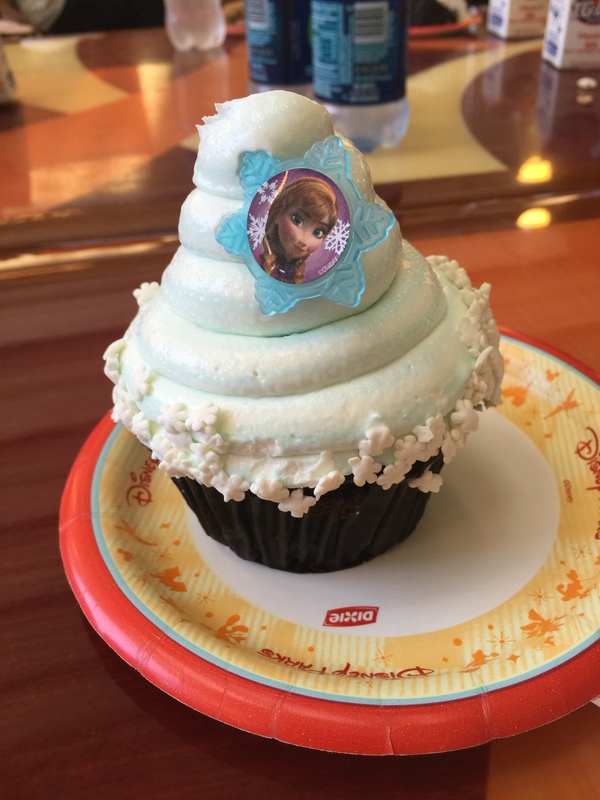 When I had walked by the desert case I couldn’t resist getting a Frozen (not literally) cupcake. The exact Disney description was as follows “Chocolate Cake infused with Caramel and topped with Swirled Butter Cream and a Non edible Souvenir Ring”. How could this not be good. 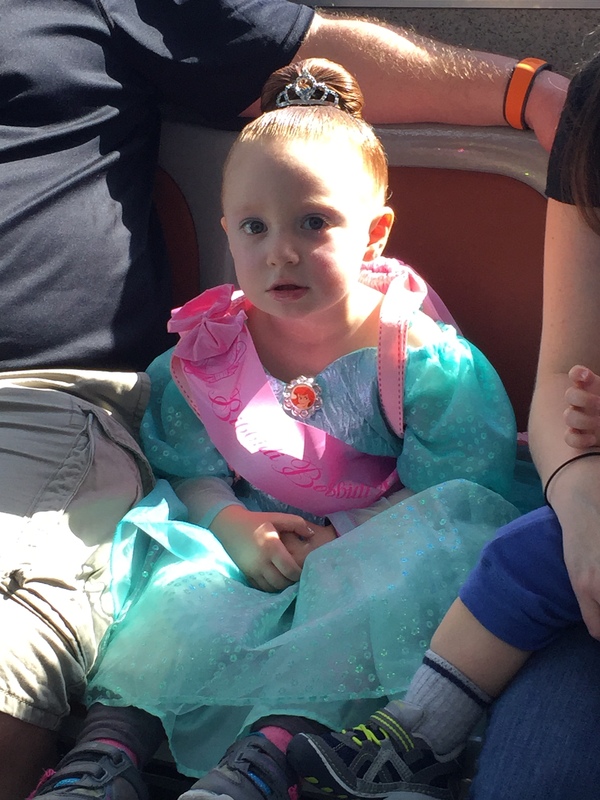 Our room wasn’t going to be ready for a couple of hours so we decided to grab one of the Disney Transportation Buses and head to Downtown Disney for some shopping and a special reservation we had made for my niece Ava. Downtown Disney has been going through some changes recently and some areas were blocked off for construction. Enjoying the wonderful weather we headed directly to the West Side where the Cirque du Soleil La Nouba stadium was located so we could work our way back. Another reason for doing this is I had news that there was a penny machine in the La Nouba gift shop. We walked and to check out the souvenirs but after pacing the entire store I asked the cashier about the machine. Unfortunately I was informed that the machine hadn’t been working properly and had been removed for repairs. So far I was zero for one on penny machines, hopefully this wasn’t a sign of things to come. We headed back towards the Marketplace where the bus had let us off and I went into another store called Marketplace Fun Finds. This little shop has all sorts of fun little souvenirs and mystery grab bags. I had already received these coins from a contact of mine weeks before but wanted to get a picture of the machine for my records. I did cave in and pressed another set (you can never have too many). The machine worked great and pressed all four designs nicely. The designs included Mickey, Minnie, Donald and Goofy. I posted a picture of these pennies in a previous post. After leaving the store I noticed it was time for our reservation at the Bibbidi Bobbidi Boutique for Ava’s Princess Makeover. The boutique was located inside the World of Disney store which is the biggest Disney gift shop I have ever seen. The makeover took about 35 minutes or so. They really do a nice job creating that magical experience. I don’t know if Ava loved all the work on her hair, but it came out really cute. By this time we were started to get a little sluggish from the early morning start. My dad received an email and text message on his cell phone letting us know our room was ready. With the online check-in we had done before arriving the message also listed our room number so we could head right up without needing to wait at the front desk. We grabbed the next bus and headed to our resort in anticipation of checking out our room. Did you notice I said room (singular). That’s right we had decided to all stay together. 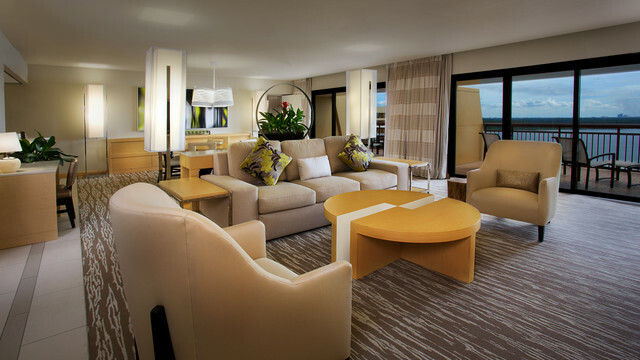 There was 9 of us in total, but the Contemporary Resort offered some nice family suites up on the 14th floor which is what we had opted for, and ended up working out really well. Upon entering our room there was a large living room, with a dining area and kitchen. There were two bedrooms, one to the left and one to the right. Each room had its own full bathroom which made getting ready each morning much easier. We had 4 balconies in total and we were facing Bay Lake which gave a great view of Epcot and could watch the fireworks right from our room. Everyone was pretty tired and ready to just relax. We didn’t have any plans that evening but did have an early start the next day. I decided to take this opportunity and jump on the monorail to get some coins from the neighboring resorts. 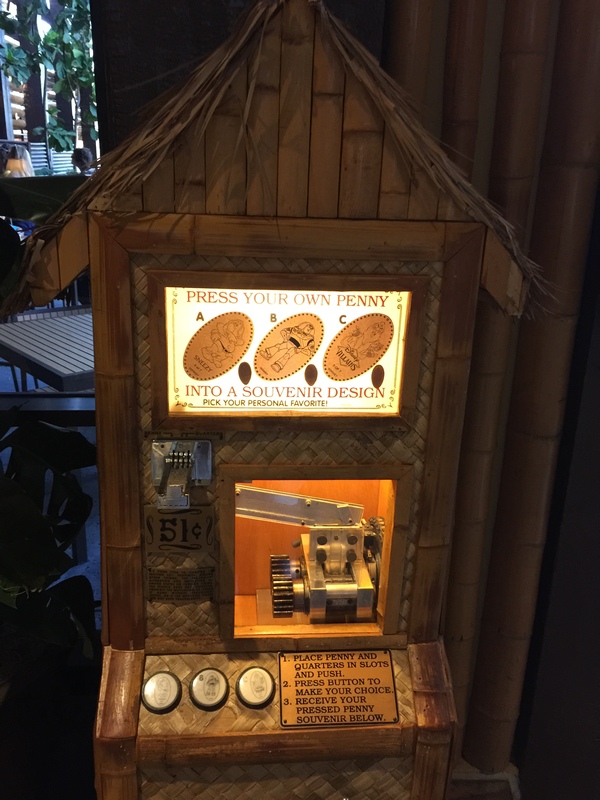 First I needed to check out the penny machines in our own resort. The machines are nicely located right beside the escalator that leads up to the monorail platform. 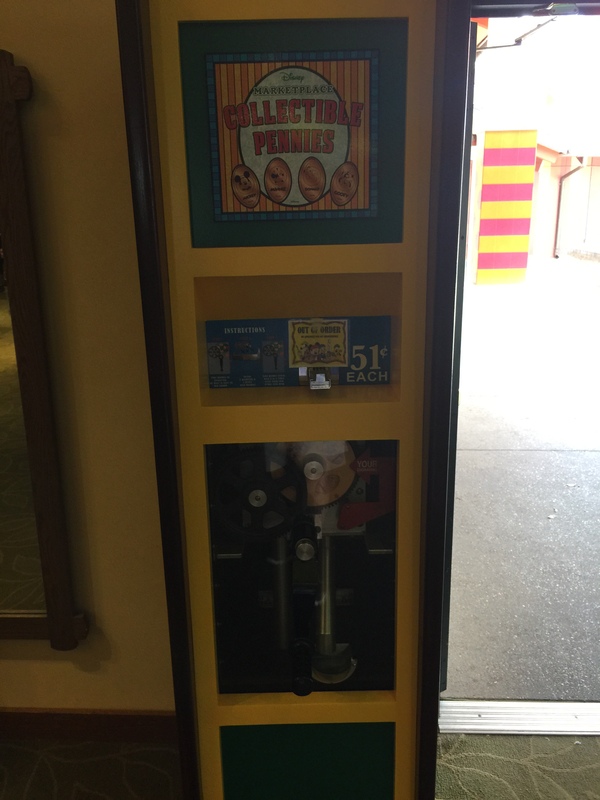 The Contemporary Resort has one of the largest banks of machines all in one place that are all connected in one cabinet. These machines are almost always busy. There is a total of 6 machines, but I only used 3 of them. I did watch other people use the remaining machines and they all appears to be working without any issue. 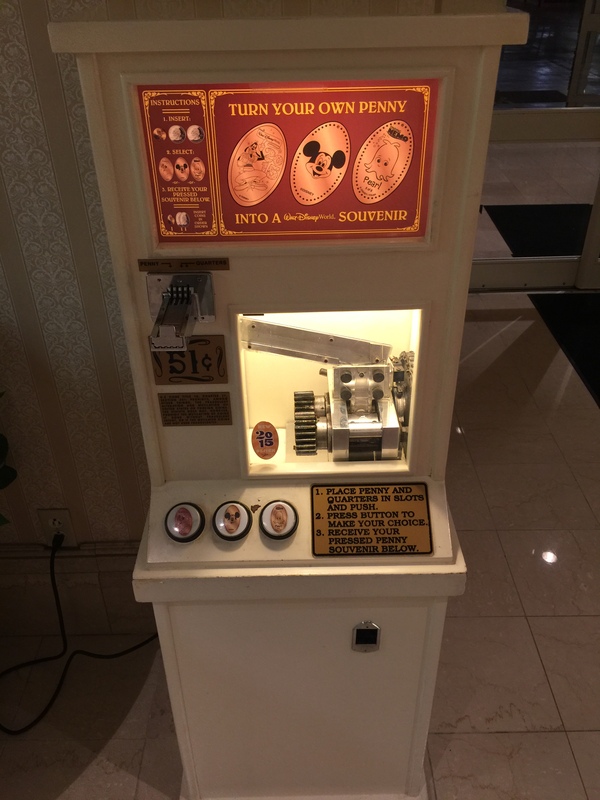 The first penny machine had a Chef Mickey design that was first made available in 2013. I pressed the design and moved on to the next machine which were Quarters. This was the first of the new 2015 designs I was pressing myself. I already had a full set at home but couldn’t resist pressing my own set. The quarter design is of Sorcerer’s Apprentice Mickey with 2015 in the background. 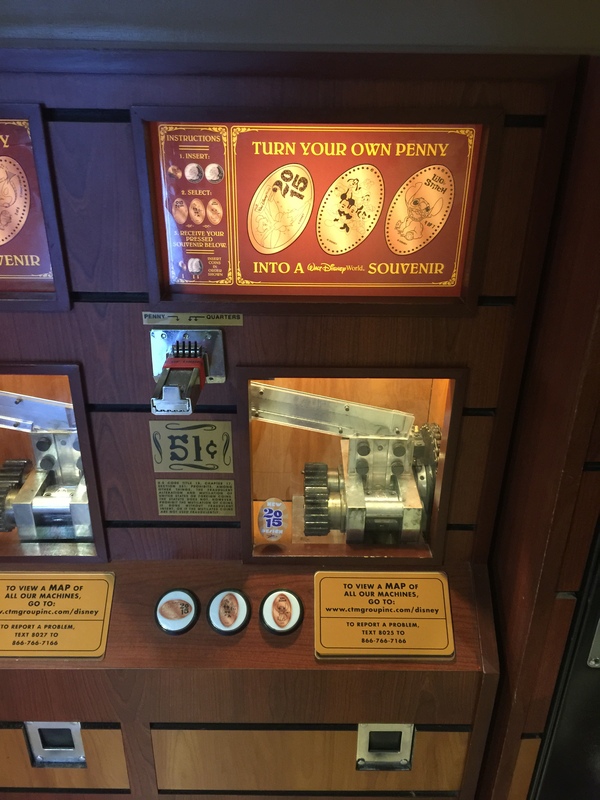 The third machine had another 2015 penny with Tinker Bell in the design. If you come across a machine that isn’t working you can send a text message to this number and let them know. I don’t know what the average time would be and don’t believe it would be while you waited at the machine. But I really think this is a great way to help keep the machines in working order. Another great tool for anyone before or during your visits is the website listed. 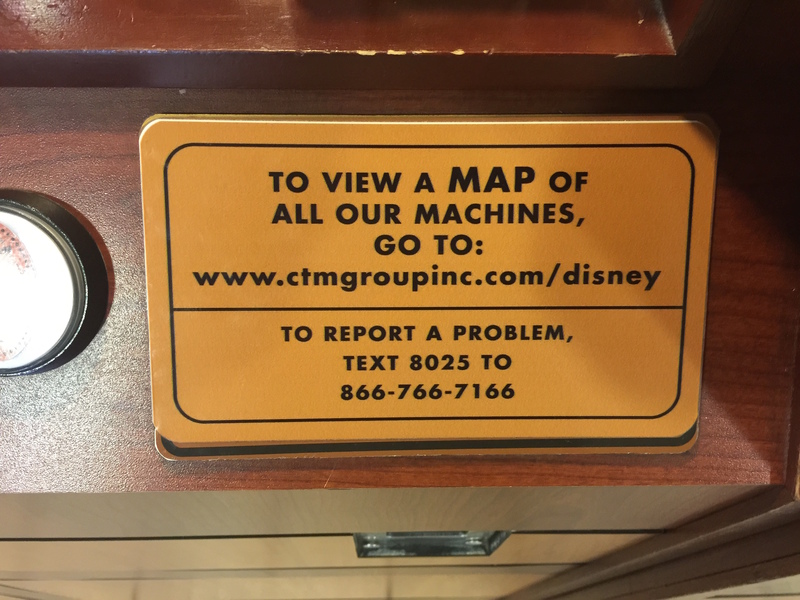 This will contain maps of each park including the resorts and will show you exactly where each machine is located and what designs are available there. I jumped on the monorail and headed to the next resort which was the Polynesian Village. There were 3 machines located here. 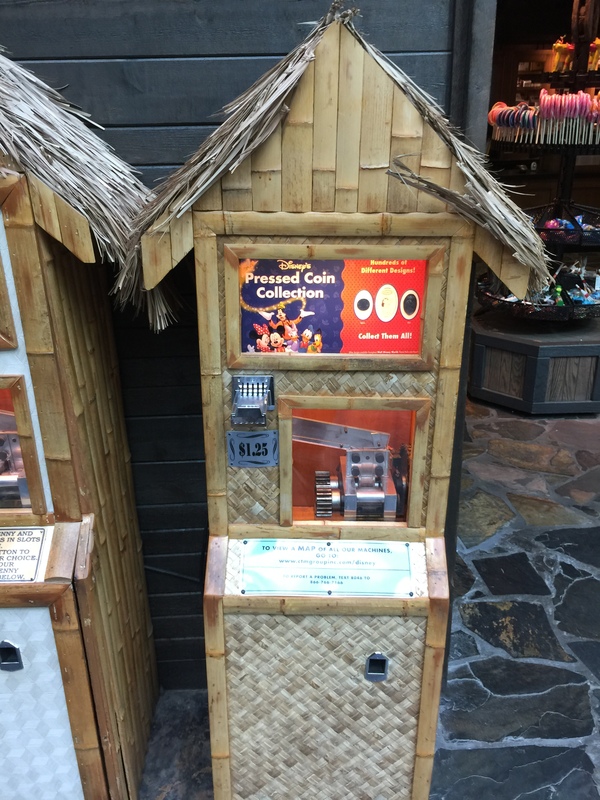 One machine is located on the first floor outside Wyland Galleries, and the other two machines are side by side on the second floor outside Samoa Snacks. These designs haven’t changed since the last time I was here. I knew this ahead of time but always love just walking around this resort and took the opportunity to update the pictures of the machines. The machine on the first floor has 3 penny designs: Sneezy, Buzz Lightyear, and Scar with the 3 hyenas. 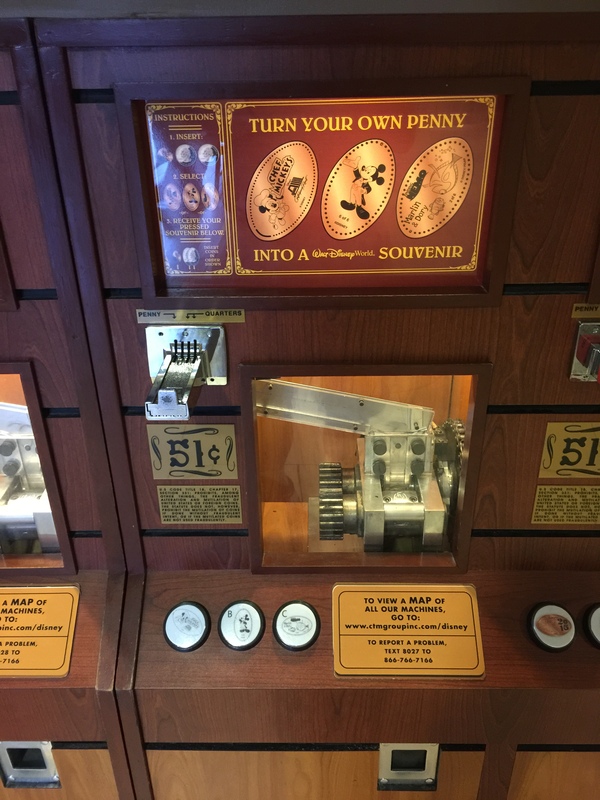 The second machine upstairs also has 3 penny designs: Pocahontas & John Smith, Pocahontas kneeling, and Bruce the Shark from Finding Nemo. 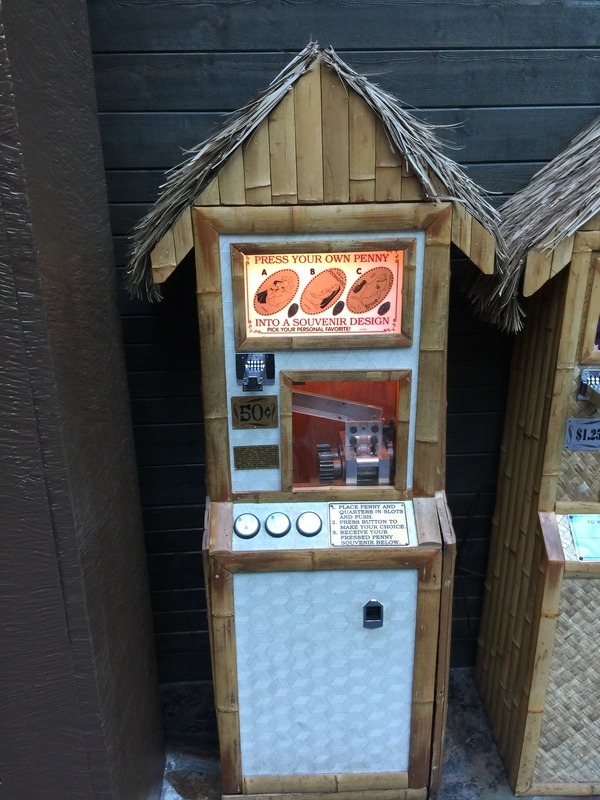 The last machine had one quarter design: Lilo doing a hula dance. My next stop was the Grand Floridan Resort & Spa. This is another beautiful resort and I spent some time just walking around and taking it all in. This resort has 4 machines but I only used 2 of them. The one I didn’t go see is located out by the bus stop area. I have collected these designs in the past, and was starting to get tired myself so I decided to skipped this one. 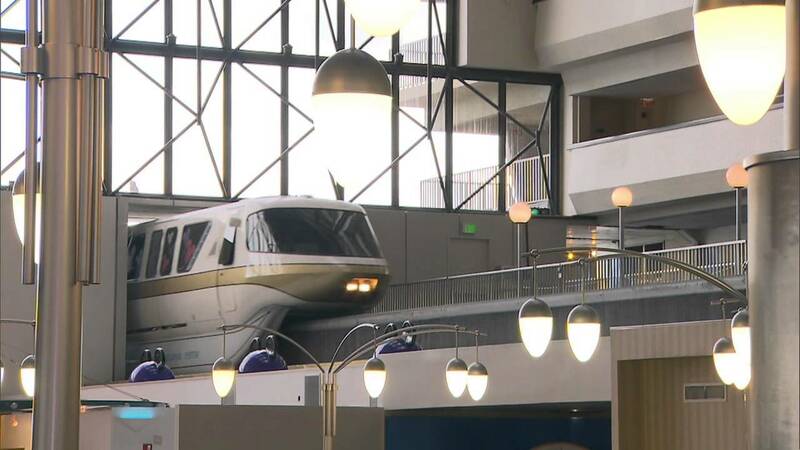 The first of the machines I did check out was on the second floor right inside the doors from the monorail platform. The other two machines were on the first floor outside the 1900 Park Fare restaurant. 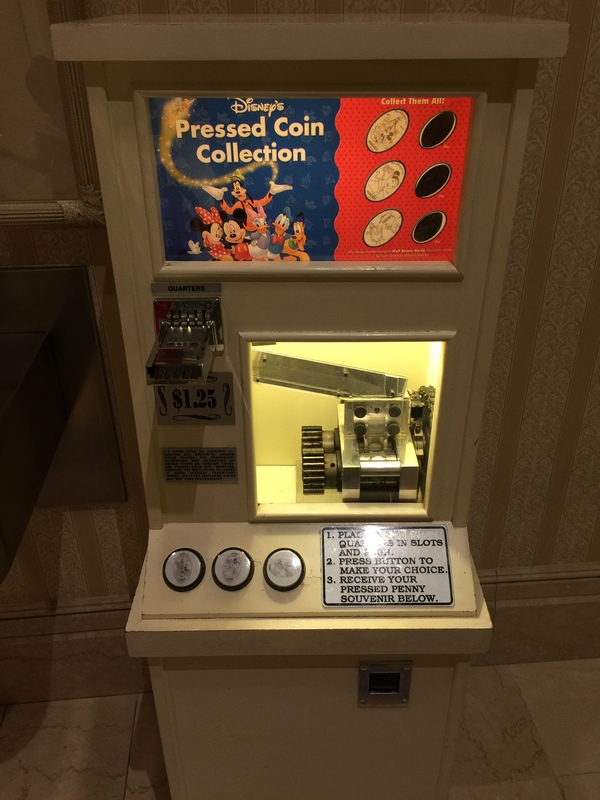 The first machine by the monorail had another 2015 penny design with Goofy as the main attraction. The last two machines I only pressed the quarter designs. I previously had these quarters but the coins I had used back in 2010 were pretty beat up and I wanted to get nice new ones. There were 3 designs: Mickey Donald & Goofy, Mulan & Mushu, and Pumba & Simba. The other penny machine located here didn’t have any new designs so I didn’t bother using the machine. Satisfied with my first days collection of new coins and updated machine pictures I headed upstairs and back onto the monorail. While on the monorail I had to go through the Magic Kingdom station before heading back to the Contemporary. 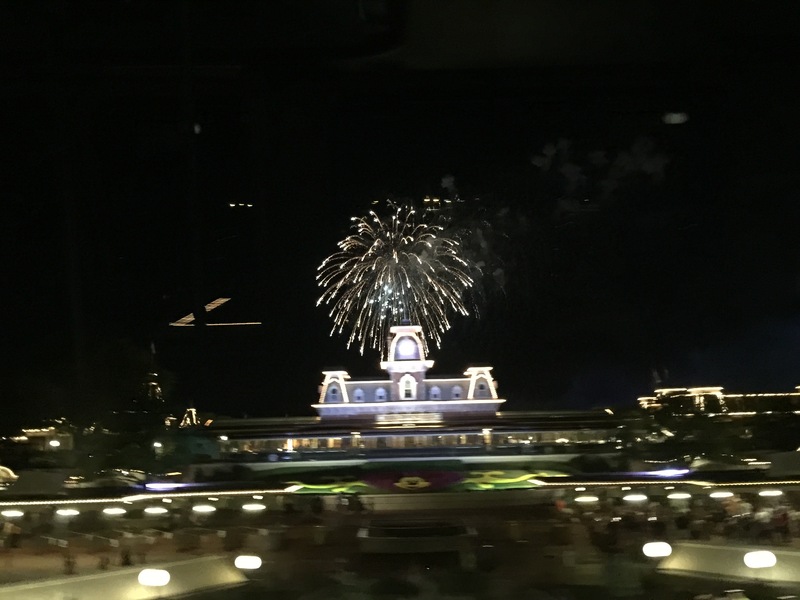 Luckily after leaving the Magic Kingdom station I had somehow managed to be passing by just as the fireworks were going on. This was a wonderful way to end out first day on vacation. We had an entire week ahead of us and I had a lot more machines to check out.